Wallyball is a game played in our racquetball court and much of the strategy is similar to that used in volleyball. Join us to meet others and enjoy a friendly game of wallyball. Tuesday & Thursday 5-6 p.m.
one another. Registration is required. 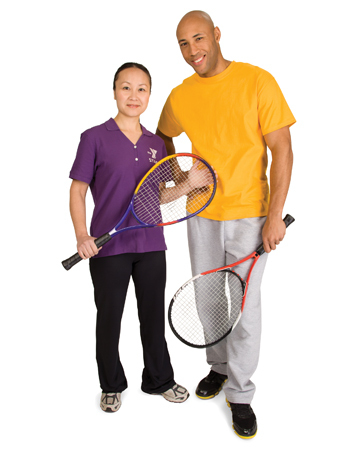 elements of badminton, tennis, and table tennis. Must be a minimum of 4 participants for Group Lesson to be held. Once Registered, our instructor will contact you to coordinate the lesson. These lessons work best for two people of the same skill level that desire to improve in a specific area of their games. Once registered, the instructor will contact you to schedule. These lessons are instructional in nature, especially suited for working on one particular facet of your game. Exp. Drive serves with power, Advanced strategy, Backhand technique, Supercharged open-stance Forehand technique. These lessons provide the personalized attention you need to improve your game. Once registered, the instructor will contact you to schedule.